Preheat oven to 180C. Grease six 2cm-deep, 8cm tart pans, with removable bases. Place on a baking tray. Process biscuits in a food processor to make fine crumbs. Add melted butter and process until just combined. Press firmly into base and sides of prepared pans. Place in the fridge to chill. Combine the chocolate, cream and chopped butter in a medium saucepan over low heat. Stir for 2-3 mins or until the chocolate melts and the mixture is smooth. Using an electric mixer, beat the egg, egg yolks and sugar in a bowl until thick and creamy. Gradually beat in the chocolate mixture until combined. Pour into tart shells. Bake for 10-12 mins or until filling is just set. Set aside in pans for 30 mins to cool. Place in fridge for 2 hours to chill, or until firm. 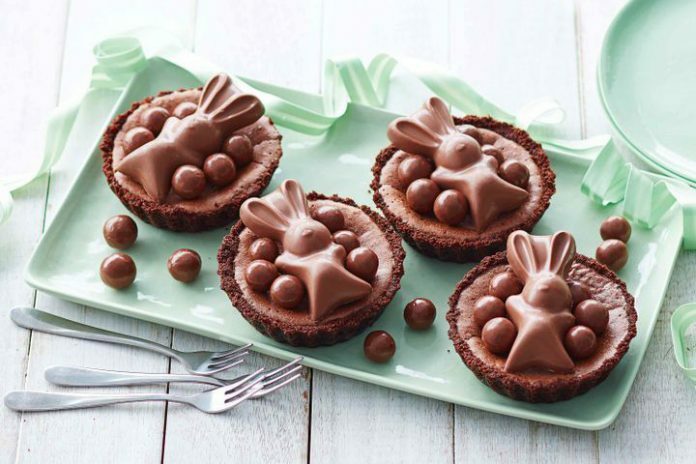 Decorate tarts with Maltesers and MaltEaster Bunnies.